Well it’s not Christmas yet, but we actually have the reason to celebrate. We reached the 10,000 members FB Group milestone today and it’s time to make Giveaway again. Big thanks to EKWB for their support. The giveaway is global, so everybody can enter. The Winner will be announced on October 16th, 2016 and will receive the EK-XLC Predator 280. To confirm your participation in this Giveaway simply comment this post and Tell us your next system build plans for 2017 or what are your hardware expectations for the next year! We would appreciate if you like & share this Giveaway on your social network. It will help YOU to get better prizes in the future. Comment on this post right? Not in facebook right? lol I’m commenting anyways! System plans for 2017? This would be a nice start though but seriously I won’t be a position where I can build a new PC or upgrade greatly but getting components from giveaways or nice deals would be a nice way to begin! I do hope I can get a case where the Predator would fit though..
I’m mostly waiting for the 1080ti to be announced before I upgrade my 980 (that I bought a few months before the 980ti came out and crushed it….) The only other thing I really want to do is switch over to water cooling and see what my 4770k is actually capable of hitting (I’ve only got it to 4.4ghz right now on air). In 2017 I plan to upgrade my current setup replacing the 980ti with 1080ti and maybe adding a custom watercooling loop. would love to get a new processor and motherboard for 2017 my sandy bridge is too old tbh. not to mention if I win that cooler I’m going to get some oc’s done! I would love to own one of the Predator Series AIO as the pump built into the radiator will really save on space, and give a great minimalistic approach to any of my PC mods. If I won this Predator AIO, I would use it in my next project which features the In Win D-Frame Mini chassis, Z170 Asus Impact and Asus GTX1080 Strix. The chassis is custom painted silver and grey metallics, and will feature custom brushed aluminium panels. -mobo: I have an Asrock Fatal1ty H170 Performance/Hyper mobo so i can OC non K cpus with it. -case: Be Quiet Silent Base 800, in 2017 i would like to replace this with a windowed case or maybe i will buy a windowed side panel for this. My system build plans for 2017 include finishing my current sponsored build- Project:Military Tech(link below). Also, depending on resources I hope to finish my Double Dragon cube ATX case build. If I can afford it, I’d like to expand my solid state storage next year. My 250GB drive is nearly full and there are a ton of games to be played soon. I’d also really like to build a NAS and get rid of all mechanical storage in my PC. The rest is still undesided at this moment as im kinda going along with what i see looks great one buy at a time. Happy moding everyone! In the coming year I hope to accomplish itx builds. My expectations for hardware in 2017 would be that Zen will see AMD successfully enter the ITX market with reduced TDP and improved performance per dollar. My new project would be a new build in a Thermaltake core X9 with the upcomming summit ridge CPU from AMD and whatever MOBO that comes out supportin that CPU. most likely an ASUS MOBO. and ofc 2 GTX1080 all warecooled with EKWB and aquacomputer. I just built a “new” PC about half a year or less, and currently extremely tight on budged, so I’m not sure I have to upgrade anything. In case I had enough money I’d add a second ssd in my system or decent discrete audio. Will soon upgrade to Skylake and change my LCS and will try Hybrid AIO that’s expandable and this would be the Belle of the ball. I’m a fan of AMD and want to bet on Zen in 2017. I currently own a FX-8320 and my plan is to replace it by a Zen CPU. I also own a R7 260X and am thinking on replacing it by a RX 460 or better if I find a good price. A couple days ago I found some videos about the Avexir Raiden memory and I think it would be great buying it for this build. The only parts of the current build I plan to keep are my SSDs and the case, a beautiful blue S340 by NZXT. I plan to upgrade to either a new GPU or a new rig all together if my budget allows me to. Maybe the new RX490 or 490x or 1080 or even the 1080ti and some watercooling gear to boot. I already have a ton lying around not being used though need a few fans and hardline tubing to make it work. Who knows where we’ll be in terms of hardware this time next year. This year was pretty exciting, if not a bit repetitive, with all the new GPUs. Curious to see where we go from here with the 1080ti, whether AMD will try and match NVIDIA’s high end tech, and if rumors of Kaby Lake’s increase in processing power are true. Just waiting for the constant barrage of financial commitments to stop so I can finally get on the case and do my first build since I was a kid. Holding down two jobs at the mo and still can’t save any cash towards it. I recently started modding my case and I find my current build not worthy of a modded case. I already started putting money aside for a i5 6400 and a 1060 6 GB version, a SSD and 12 or 16 GB of DDR4. The hardest part will be to build a custom closed loop for the CPU, one of the most expensive parts in a build. I think the Predator will do a better job than my own custom closed loop only for the CPU considering the fact I have never done it before. Waiting for Zen cpu’s to come out. Especially low powered APU’s for htpc. I hope Kaby-Lake overclocks much better. For my next setup I have a motherboard gaming z170N gaming 5 and a case deepcool, my plans are to get the other components and to enjoy!. My hpefully new system is madeup of parts that I have and parts that I need. Hopefully It will be done by next year. Also what I really hope as far as hardware is concerned is for it,esp the gpus,to be in stock at close to real prices. Hopefully building Zen/Vega mini-atx in the new year, and moving existing pc into a new case. Next system build will be based on the AMD Zen CPU. Can’t give all the details yet cause I don’t even have all the details on the Motherboard maker, chipset. But will go with 16gb of ram ,1080TI, Evga Supernova GT 850 , and house it in either another Phanteks Enthoo Pro ( love that case ) or Try out the Fractal Design Define S ,or Be Quiets DARK BASE PRO 900 with all be quiet! SILENTWINGS 3 fans . Congrats on 10K members in the FB Group ! Expectations? Not so much marketing but a real increase in performance with next hardware to come both from AMD and Intel. Thank you for the chance to win this beauty! My plan for 2017 will be full watercooled system using this predator EK kit as it is capable to do so, as for hardware, I am pretty happy with my current i5 6600k and GTX 1070, and therefore this EK Kit is what I need right now. I am planing on upgrading my old GTX 780 to a newr GPU probably the RX 490. Well, my plans for my pc are pretty simple, just keep it up to date enough to play video games at a reasonable frame rate. My plans for 2017 is to upgrade my poor r9 270x. I will probably go with a gtx 1070. I have an i5 6600k, an MSI z170 m5 motherboard and 16GB of ram. I’m already planning on getting a new computer, since I’m still using i7 920, and it’s just not enough anymore, even though it has served me good 7 years. With getting EK-XLC Predator 280, I could invest in a quite stronger processor, and maybe even liquid cooled GPU solution from EKWB, who knows. Something like this would make me able to build quite a strong computer, while being on air just isn’t enough for those top builds or some sick overclocks. Looking forward for my next enthusiast build of Skylake X, next year hopefully, and will definitely have EKWB cooled all those precious chips! Don’t really have any plans. I’m hoping to maybe do a platform upgrade (motherboard, cpu, ram) next year, but I have to see if I can afford it. Until then, my old i7 2600K overclocked to 5GHz does a pretty decent job. I plan on getting two 1080tis or similar cards. a 1tb 961 SSD and a lighting kit to finish my Lian Li pc08 build. Well this is an Awesome Give Away! I have a Great Plan for my 2017 Build.. Currently my build was built on 2011. almost 6 years old.. I planned to sell this one and assemble a new one in 2017.. Planned Specs follows..
Those are my Planned Specifications and Under my Budget.. Hope i will win this Precious EK Cooler. Nowadays i´m running a Sandy Bridge cpu, for 2017 looking forward kaby lake. Nice giveaway, thanks! After having my current system for nearly 7 years its time for a full upgrade, wouls love to build 7700k, Sli 1080T hybridi and mix in some EK water cooling as never had chance to do any and its the way to go !! Hoping that Zen and Vega will be good, I plan to make a full AMD build in 2017. Looking forward to GTX 1080TI next year for upgrade. Thank you for chance of winning this, always wanted to try out EK water-cooling. Waiting for 1080ti to get a sli for 4k gaming. Planning on building a new work build next year. Still waiting to see if i should get Kaby Lake but right now i am still at the “starve myself and save money” stage though. Next year i hope for 1080ti. If i win this giveaway, the ti gets an prefilled EKWB, too. I would really love to get an EK-XLC Predator 280. It would fit perfectly in the Xeon storage server I plan to build this winter. Just started out with a InWin GRone black with plenty of room to work. Stuffing it with a MSI Z170A-G45 Gaming, i7-6700k, GSkill DDR4-3600 MHz RAM, twin MSI GTX-980 Gaming 4G with EK full cover block and backplate just for starters. I’m waiting on a 360 mm radiator for the top. I already have 3 NF-F12 fans for it. My new EK-XRES 140 Revo D5 PWM pump/res combo with 120 mm fan bracket arrived yesterday. My centerpiece is my trusy EKWB Supremacy EVO full copper CPU block. Power comes from a EVGA 1300 G2 PSU and data flows through a pair of Samsung 850 EVO 500 GB drives in RAID-0. I hope I haven’t forgotten anything but it is still a work in progess and changes might be made. Also have a Monsta 360 hanging off of the back with a Koolance mounting bracket. My next build will be a upgrade of my gpu. Right now I have R9 390 from Sapphire, but I am waiting for new gpus with HBM memory. I think I will get new 1440p monitor with new gpu. But for this year Im looking for some watercooling AIO for my cpu, maybe I win this predator. Thanks for giveaway and good luck to everyone. Will most likely be buying a top of the line Vega GPU and will be reusing my 5930k CPU. I have an I5 3570K and with this water cooling solution and a new power supply i plan to overclock it! I hope to upgrade my CPU and GPU in 2017. My next build will be a Corei7 6700K with Asus Strix GTX 1070 and 16 GB DDR4 Ram, Z170 MSI motherboard. All wrapped up in a Corsair Case.. Thank you for the opportunity ? For 2017 I hope to get a build done with the GTX1080 Ti, right now I am working on something with a lot of LED lighting that might be done this year or very early next year. In 2017 I will buy only one SSD and maybe a mechanical keyboard. A completely new PC will have to wait until 2018 and will be based on the new AMD CPU Zen. I would like to upgrade from a Z170 Mini-Itx to a Z170 ATX Mainboard with dual or triple M.2 Slots. I will keep my 6600k and delid it before re-installing my noctua NH-U14S. Anyway the temperatures of my EVGA GTX 1070 should be reduced by a EKWB Predator 280 connected to a full gpu cover by EKWB. SkyLake-X is coming out next year and I will probably upgrade from my X99 motherboard to a Skylake X motherboard and processor. I might also upgrade my memory but that depends on my budget. Awesome Giveaway! Thank you for the chance to win this liquid cooling unit. My next system build will be with Z270 board and i7-7700K CPU. Currently I have i5-3570K, Asus Maximus V Gene and GTX 1070. Waiting the 1080ti to replace my sli 980 ti strix (watercooled with ekwb qdc waterblocks) less heat less noise better performance! I’m working on a build based around z170x-soc in a modified air540. The colors will be black, white and orange. And it will have a full custom loop. next hardware upgrade will hopefully be a custom WC GTX 1080TI and expectations would be price drop in GPUs. I will se how much $$ will I have and what new stuff will get out on market..
My upgrade plans for 2017 would be an SSD for my OS , additional screen for music production and more ram (Upgrade from my current 8gb to 16gb) I would love to upgrade my cooling system but financially that isn’t at the top of my list. This giveaway would be perfect for me since the EK-XLC Predator 280 actually supports my current socket (1155) and my pc case also has watercooling functionality which I have never utilized. I would Love to shove this in My fractal nano s and include the entire system in One Big predator Loop and maybe add another 120 rad for extra cooling! Looking forward on finishing my fist hard tubing loop. I’ve never won something before so I would appretiate it! Really looking forward to building a Zen/Vega system next year, and hopefully moving from air to liquid cooling at long last. I plan on buying a GTX 1080 and water cool it with a nzxt x31 :).And if I can afford it is would like to change my current 1150 platform ( 4770k) with x99 with a i7 6950x or 5960x whatever i can find cheaper. Let’s hope it’s a good year and I upgrade my platform. I would love to have two GTX 1070’s, but I’d need to be sure they used Samsung memory, not Micron. Latter has issues I’ve read. 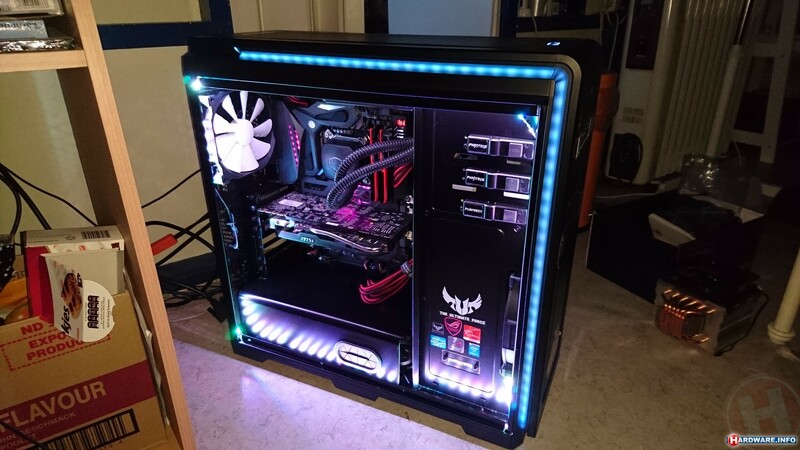 I wan’t to replace my current case with a Be Quiet! 900 Pro. Other than that I’m thinking about getting a 1080 Ti when it arrives. Not falling for being to quick again (like when I got my 980…). Well I hope that I’ll finally buy Samsung 850 EVO and maybe get another 8gb ram. AMD Zen CPU, Asus X370 chipset motherboard, AMD Vega 10 GPU, 32 GBs Avexir ROG Red Plasma DDR4 3000 RAM, Corsair 1200 watt PSU, Samsung 256 GB 950 Pro m.2 boot drive, 2x 1TB Eluktronics Pro SSDs Sata 3 striped. Thermaltake Core V9 case. This would be a cool prize for a new build or just to refresh an older system and given EK’s reputation for top notch products it is sure to be worthy choice for most any build. I would like to finally be able to build an allout watercooled pc on my own for 2017+. I just finished a rebuild but due to my budget I couldn’t afford a watercooling system for my CPU. I’m hoping to up my RAM next year and maybe my video card. I would like to upgrade to a 1080ti if does get released in 2017. Also, upgrading to the 7700k would be great. I need a new system from the ground up, as my current one is 9 years old running an AMD x2 6000+ , and a HD6800. I`m thinking an intel 6600K paired with a Z170 board, AIO watercooling and a GTX1060 or maybe 1070 if i will have more funds. Since I live in the hot Australian climate, my Gaming PC suffers. I plan to upgrade the cooling in my rig to prepare for the hot summers. The high quality EK cooler will allow me to get lower temps, so I don’t have to sacrifice as much performance. I have no specific plans for 2017 but my current PC, which isn’t that old, has a memory problem. In that they are no longer making the RAM that runs in my machine. I only had 8GB and when I found that out I had to run and buy another 8GB used RAM for future proofing. Either way, I will have to completely build a new rig, the next time I Upgrade my system. if it proves worthy,as I am currently using a FX-8350. maybe some graphics update… dunno, I have much time to think about it. Think I might skip 2017 and wait for the X99 replacement and the Volta Nvidia cards. I’m have already upgrade my nice RGB led game pc. only need a upgrade a VGA card and upgrade for the liquid cooler. Just built a rig with msi z170a gaming pro carbon, 6700k, 16gb 2666mhz corsair lpx, and 2 gigabyte windforce 2 oc gtx 1070s all packed in an h440 by nzxt. I don’t have a ton of plans for 2016 but have been pricing out a custom loop from ek and this predator would help in that for sure. Also if the 7700k is 10% or more gain clock for clock (looking like it could be a big jump compared to previous difference in generations) I will be grabbing 1 of those early next year as well as upgrading to 32gb of ram. Rig is all sleeved black cables with wire combs, very clean, nothing in the rig is not black or grey except lighting which is white. A predator would fit perfect in my case and add a lot aesthetically as I’m currently on air. Thanks for the chance ! Going to check out the new ZEN CPU’s, and possiy upgrade to them. I’m waiting for the ZEN CPU’s to come out, then I may upgrade to one of them. All modded with clear tube. I am building a custom case so this would be an awesome addition! Hello all, my next goal would be getting the AMH A409U, you should take a look at it, i know you’lll fell in love :p lol…. In the other hand, i’m using an old Thermaltake Big Typhoon fan cooler to keep fresh my i5 but i know the predator 280 woul be a really great adition to my hardware and my PC will apreciate it. Good luck to you all. Blessings. Planning on adding a second 1080 FTW to the system. Already have the 20011-v3 6900k cpu so not really in need of an upgrade there. Really the only upgrade id like is for another case. Right now im using the Thermaltake white cube design with the horizontal mobo style, and I hate it. Im going back to my old case. Corsair 900D. Its almost time to go for a full watercooling loop. Currently using a predator 360 with QDC thats hooked up to CPU and GPU anyways. Might as well go for the full thing. Id really like if I could buy another predator with just QDC on the end because i dont need to cool another CPU after all. Would be nice to have more cooling power though. Depending mostly on budget next year, either it’ll be a total new gaming rig or an upgrade for my old GTX 680 4gb I’m still using at the moment. With it, this AIO CPU watercooling system would be just perfect for both actual and next rig. For 2017, Kaby lake i7 7700k OC, GTX 2080 ( ti ) , 960 pro samsung m.2 , 4k screen 😀 in a nice case with some glass 😀 Good luck and thank for this give away . My plans mostly revolve around a computer that’s better geared towards gaming, recording, and game modding. Mostly it comes down to whatever I can afford and/or if I manage to get a sponsor some how. Would really help me as I learn more overclocking. Kinda on the fence as whether to upgrade my CPU and Mobo which is a 4670k and an Asus Z87-Pro or upgrade to next years Nvidia x80 or x80Ti. A VR headset would be nice although not a priority. I’d like to move up to an i-7 or whatever AMD’s equivalent will be in Q1, right now my FX-8320E is doing ok, but its holding my 1070 back so Id like to watercool a higher end CPU and have that last my a while. Considering a 6700K and Z170 when the price drops after the release of the 7XXX series and AMD’s new processors. Going to replace my watercooled 780 ti sli with 1 gtx 1080 ti. And getting my motherboard and 3930k back on a custom loop, unless I win this cooler. I’m looking to upgrade from my 3570k in 2017. With Zen and Kaby Lake coming out soon, it’ll be an interesting decision on which to pick. I also plan on going with a Predator AIO cooler and adding a water block to my Gigabyte G1 Gaming. I’ve considered doing a custom loop, but I’m worried about leaks and the Predator AIO looks to be the perfect solution for me. I plan to finish my case mod consist of two zalman MS800 and add another one gtx 980 watercooled by EK. I would use Predator 280 to cool my i7-5820K on RVE… At the moment on 4.2GHz 1.200V with almost 5 years old H100 under stress test hit almost 80C. 🙂 For future I plan to install new GeForce 1080 with AIO or waterblock connected with EK Predator. But I expect from NVIDIA to present second generation of Pascal and than to decide between GTX1080 or new version. In Q3 2016 i abandoned HDDs and in future I plan to remove OS from SSD to M.2 NVMe. 1TB SSD SATA III will serve as gaming drive with one small SSD for Backup files and different OS. In 2017 biggest expectations I have off course from Skylake Extreme and new Intel Xtreme Socket/Chipset. I expect really great platform and excellent Intel Processors and many beautiful motherboards. Waiting for RL Kaby Lake and AMD Zen performance tests. Planing to upgrade my graphic card and getting some moar storage. Hi, My upgrade plans revolve about ZEN currently rocking a 8350 and hope that zen will bring AMD back where it belongs. also planning on getting a Vega GPU to get a high end all AMD system. My plan for beginning of 2017 is to upgrade my PC. I’m waiting to see how Zen performs vs Kaby Lake and I will choose accordingly. Same goes for GPU, waiting to see what Vega brings to the table. Hope it can keep up with nvidia high end GPUs !! I’ll be expecting the 1080 ti next year. I’ll definitely be picking one or two with water blocks. I’m currently using a 4790k and have no plans upgrading to Z270. Maybe when Ice Lake or Tigerlake are released, I’ll upgrade. I’m hoping to upgrade to a 1080 and watercool it. But I might wait and see what AMD’s Zen brings to the table. Anyway, watercooling is defenitely planned! For 2017 I definitely have some plans for minor modding (like change the case fans and pump controller), but it heavy depends of my finansial situation, which is quite terrible right now. Well I’m just waiting on Zen and Vega coming up. A Xeon processor and going X99 are my plans for right now until something better is on the table. Looking forward for a great cooling solution for my next build on 2017. Hopefully going to go for an X99 build next time and as you all know it’s quite an expensive build, having this will be a dream. Thanks! Planning to build new rig with i7 6700. EK-XLC Predator 280 great chooise for that. Maybe daisy chaining two Predator for a bigger loop!? ffs… dubble post, sorry about that guys, can a mod remove the other one? OMG, who wouldnt want to win this, its a great AIO cooler, and I would be honored to have it in my case. I would like to finally finish my new system on the LGA 1151 socket.